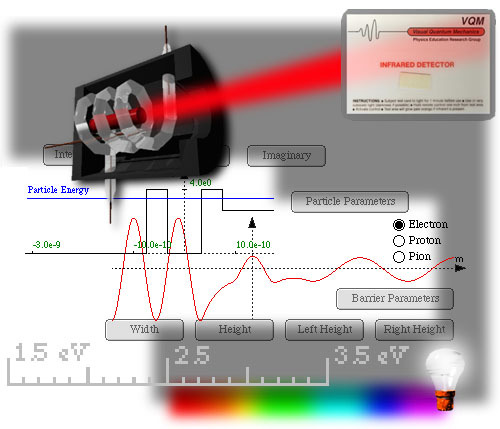 Visual Quantum Mechanics - The Original The original Visual Quantum Mechanics project developed materials for high school students and for non-science college students. VQM - The Next Generation Teaching-learning materials for science and engineering students who have complete a two-semester calculus-based physics course. Advanced Visual Quantum Mechanics Interactive Engagements for use in an upper-level undergraduate quantum mechanics course. All materials are available for download. Software Online versions of software developed by the project or obtained from other sources with permission. Modern Miracle Medical Machines Instructional materials relate contemporary physics to modern medical diagnosis and treatment. Publications Journal articles and related publications Papers from proceedings and journals.